Measures 9 3/4" x 6" x 11 3/4". This wire cookbook holder allows you to keep your recipes handy while cooking,and the upright design makes for an easy reading experience. 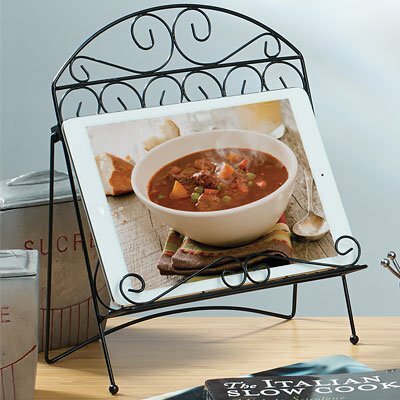 The cookbookholder is a great way to keep your cookbook, tablet, or phone from gettingdamaged during the cooking process. When you're finished, the wire cookbookholder folds for easy storage. Keep recipes handy while cooking. Black decorative ornamental design Works great with tablets! 9 3/4" x 6" x 11 3/4"